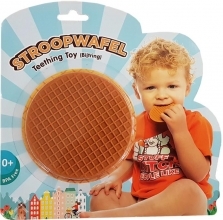 Lucky for them we`ve developed `Stroopwafels For Babies`. A yummy teething toy that even the tiniest of tots can enjoy! Our 100% non-toxic food-grade silicone will help soothe aching gums and keep little ones happy and entertained for hours!